In this special episode of For Good, Brian Payne talks about dismantling systemic racism—one of five of CICF’s leadership initiatives for Marion County—and how it is impacting our community. This episode is part of a special series introducing CICF’s strategic plan for Marion County. Listen to the other four episodes to learn more about how CICF is working to help create a more equitable Central Indiana. BRIAN: Hello. I’m Brian Payne, president and CEO of the Central Indiana Community Foundation. CICF has a mission to mobilize people, ideas, and investment to make this a community where everyone has equitable opportunity to reach their full potential, no matter place, race or identity. We are committed to this mission for the next generation, or maybe two generations if it takes that long, and we have five initiatives that will help us execute our five-year strategic plan, the first step in executing on this mission. One of those initiatives is dismantling systemic racism. Systemic racism is where racist actions, policy, systems have happened over time, and there’s a legacy of these systems that have maybe come from a direct public policy, maybe a direct law. Maybe that law doesn’t exist any more as a racist law or that policy has been changed, but the outcomes have not changed. It all adds up to keeping people down because of their race, their ethnicity, the color of their skin, and you might say, “Well, that doesn’t exist anymore,” but it existed for generations, and the outcomes, the outcomes, still exist. I’ll give you an example. The FHA, Federal Home Loan Administration, that was loans for people to have easy access to mortgages during World War II and after World War II. They were not available to people of color, and the federal government, in actually giving loans for new developments and new housing developments, actually had policies that no African Americans could live in those new developments. So what’s happened is that there was a lot of subsidy given to white families, and that created wealth, and that wealth has been handed down over generations. Some of those houses that were $30,000 homes are now $800,000 homes. Those have been, that value, that wealth has been handed down from one generation to another, but only if you were white. So African Americans didn’t get that opportunity. That has a huge legacy of systemic racism. There still are systems that actually were created to help create wealth for white families that did not include people of color or African Americans. This idea of dismantling systemic racism, we talk about it in one way as an initiative, but it is actually the initiative that is foundational for the four other major initiatives. We’re looking at everything we do with the lens of equity, opportunity for all, and inclusion, and we’re looking for where are there racist systems and we’re looking at where are there limited perspectives, everything we do, how do we see it through the lens of inclusion of all, lifting up voices, lifting up perspectives, tradition, history from everybody, not just from people who are white. This is a commitment of dismantling institutional racism for generations until it’s dismantled, and one of the things that we know and believe in, there is no exit strategy for opportunity, equity, and, and inclusion. It is a lifelong journey. Everything we do, the foundational element is dismantling systemic racism. But then the question is, well, okay, yeah, that’s great. How are you going to do it? The first thing we know is we have to do internal work. CICF from, for all 18 years that I’ve been here out of, out of its 102 years of existence, of history, we certainly had, you know, good intentions about diversity and inclusion, but, you know, again, we have 100 years where way too often it’s just been a white person’s perspective that has created the strategies and made the decisions on where assets go, and even though again those assets, a generous amount have gone into communities of color, it’s been decided in what way they go there by white people who are not hearing all the different perspectives and voices of the people of color that we’re trying to support. So the internal work is incredibly important, and certainly we evaluated the diversity and inclusion in the power base of our staff and our board. We want to help bring these conversations and opportunities for other people, both white and people of color, to learn more about these systems, these racist systems that have existed in America and how they happened, why they happened, how they still have a power today. So, education, giving people a chance to learn the history, we’re trying to bring that other perspective. What is the American history of black people and people of color in America? It’s a different history than it is for white people. We need to get people to understand that. So there’s a lot of knowledge, education, conversation, but then we’re actually going after public policy. We’re going to actually look and identify where these systems, ’cause it’s not, race relations is important, but if we just solve race relations and don’t attack these systems, people will not have the opportunity to reach their full potential. So it’s first educating people, building partnerships, learning, listening, but a big part of our job is to shut up and show up, learn and listen from people of color in neighborhoods, what they want, not what we think they need, not what we think they want, not what we think their hopes are and their dreams are, but to shut up, show up, listen, learn, and have, and, and take in their knowledge, their hopes, their perspective, their expertise, and then help bring resources to their wishes and dreams as appropriate, and not lead with resources. Lead with understanding and learning and listening, but then use all of that new knowledge and those new partnerships and that trust and those relationships to actually go and change policy and change systems. Highlight where systems are unfair, where they’re not equitable, and then do something to change that. We’re hoping to argue the moral and societal imperative of this work, that it’s the right thing to do for everyone is, that our society will be better off. It will be less violent. More people will thrive, and ultimately it grows abundance. It’s actually not a zero-sum game. It’s not about taking from one and giving to another. It’s about creating an environment where everyone can be more abundant, and ultimately, we all win, and we really believe in that. It’s going to be a huge challenge. We’re going to take it five years at a time with specific goals and objectives and partnerships. We are in this for generations. 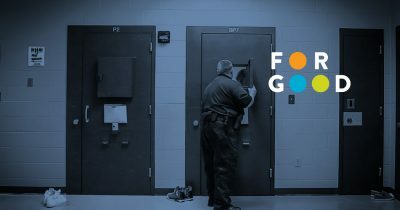 In this special episode of For Good, Alicia Collins talks about criminal justice reform—one of five of CICF's leadership initiatives for Marion County—and how it is impact…Read More.